Textiful integrates with InfusionSoft and allows you to sync collected email addresses and other information to the InfusionSoft. First you will need to authorize Textiful to integration with InfusionSoft. Click the "Integrations" tab. Find the InfusionSoft section and click the link "Click here to integrate Textiful with your InfusionSoft account". You will be taken to a page asking for your InfusionSoft username and password. Enter your credentials to authorize Textiful to talk with InfusionSoft. Once Textiful is authorized, you'll need to enable and customize how email addresses are synced to InfusionSoft. On the keyword details page in Step 3, check the "Sync collected email addresses to my email list" box. Below that check the "Sync Emails to InfusionSoft" box. If you do not see the InfusionSoft checkbox, click the "Add more email integration options" link to go to the Integrations page and follow the instructions in Step 1 above. Click the "InfusionSoft" tab in the left hand navigation to view all of the InfusionSoft Sync options. When a someone provides their email address, Textiful will automatically add that email to your contact list and enable them to receive emails from your Infusionsoft account. 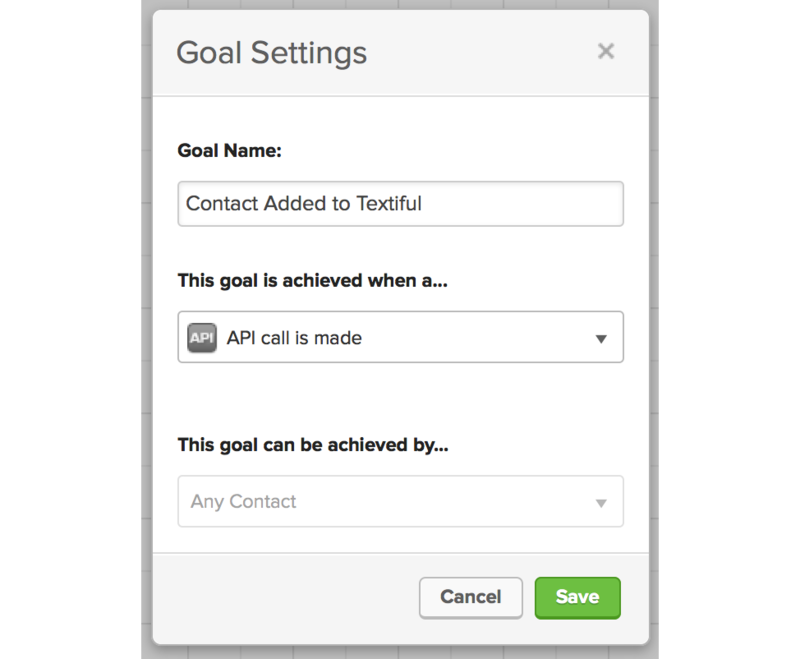 Textiful will also trigger an API Call when a new member joins your keyword and you can use as a Campaign Goal. The goal can be used to start / stop a campaign or to trigger a new sequence within a campaign. Add a new goal to your campaign and title the goal as you wish. 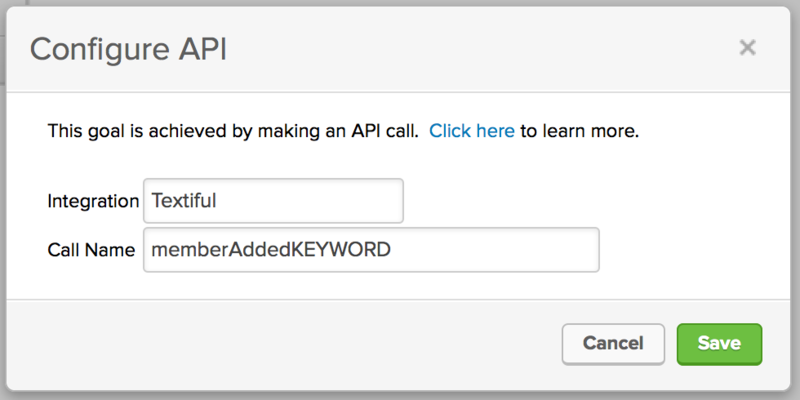 Select the "API call is made" option. Be sure to replace `KEYWORD` with your actual keyword. You can have Infusionsoft send a text messages to contacts that have joined your keyword. Textiful will not send text messages to contacts that did not join your list by texting ACME to . Add a "Send HTTP Post" to your Sequence. This can be found under the "Process" section. Configure the HTTP Post with the following settings. Please Note: the items on the left are case sensitive so make sure you type them exactly as shown. Text messages have a 160 character limit. Any message over 160 characters will not be sent.